The Internet of things (IoT) is a popular term used to describe a network of physical devices connected with each other to exchange the data they collect. IoT devices are becoming widespread on a consumer level, making peoples’ lives more efficient. Used on a city level, however, the IoT can help make Smart Cities green and eco-friendly. 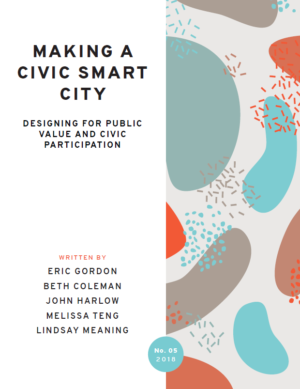 This white paper is a modular tool for public, private, and government sectors designing processes of public participation in smart city planning. Rather than governments and corporations embracing smart technologies in search of problems, a civic smart city works with citizens to define problems, and reflect on potential solutions, before implementing new technologies. 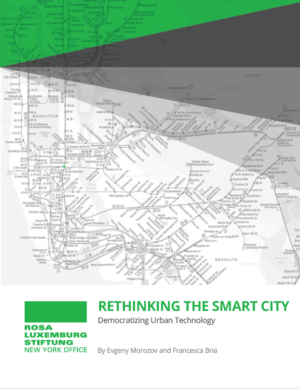 It is a collaborative work between the Engagement Lab at Emerson College, the City as Platform Lab at the University of Waterloo, and the Center for Smart Cities and Regions at Arizona State University. In this report, Francesca Bria and Evgeny Morozov discuss how cities can regain control over technology, data, and infrastructure, as well as over the services that are mediated by smart technologies—such as utilities, transportation, education, and health. Through a wide range of case studies from across the globe, the authors discuss alternative smart city models, which rely on democratic data ownership regimes, grassroots innovation, and cooperative service provision models. (Smart) Citizens from Data Providers to Decision-Makers? In his new article, Dr Igor Calzada discusses the role of citizens and their relationship with data in the smart city paradigm. 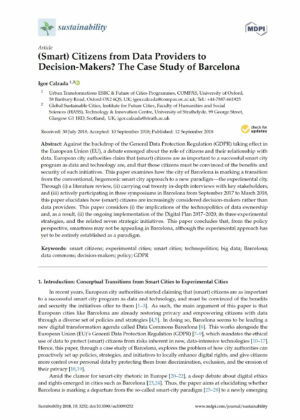 Through a closer look on the case of Barcelona, he argues that there is a growing consideration of citizens as decision-makers rather than data providers. The article is entitled “(Smart) Citizens from Data Providers to Decision-Makers? The Case Study of Barcelona” and it is open access. The Colorado Open Lab, an Internet of Things engineering lab for customer development showcase and innovation collaboration to fast track development of IoT appliances and AI-enhanced applications, will open before mid-2019.